German Christian missionaries led a crusade throughout the Moravian Empire in the second half of the 8th century. In an attempt to prevent the demise of the Slav language, Prince Rostislav engaged two learned monks from Salonika, Cyril and Methodius, to translate the Bible into Old Church Slavonic. This move was opposed by German bishops and Methodius had to travel to Rome to defend the translation. He succeeded in securing Rome’s permission to continue his work and was appointed archbishop of Great Moravia for his efforts. Methodius and Cyril’s translation was instrumental in the survival of the Slavic tongue in subsequent centuries, and they became the Slav people’s most popular saints. 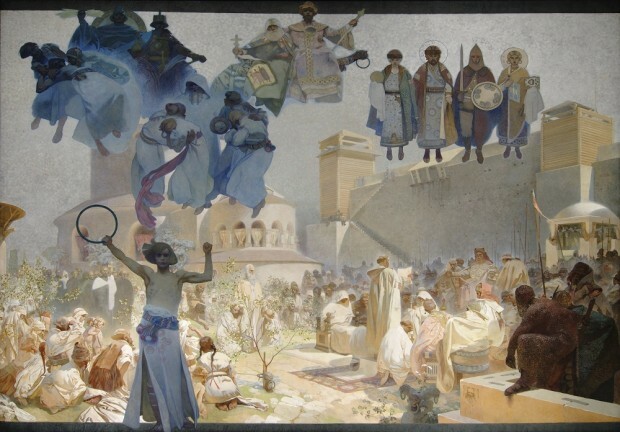 Mucha’s third composition in the cycle depicts the triumphal return of Methodius to Great Moravia from Rome. Methodius is the bearded figure to the left of the centre supported by two of his followers. Prince Rostislav’s successor, Prince Svatopluk, sits on a throne to the far right of the composition and listens as a priest reads a letter from the pope. Represented in the top right of the painting are the stylised figures of rulers who supported the spread of Christianity in the Slavic language: Boris of Bulgaria and Igor of Russia and their wives. In the foreground, a figure of a youth with a clenched fist and a circle in his right hand symbolises the strength and unity of the Slav people.